Hot on the heels of a great 2.4.0 release, the Amarok team is proud to announce the immediate availability of Amarok 2.4.1 Beta 1, codename “Ringscape”. Aside from the usual load of bug fixes, this beta release brings several new features, such as a new preview mode for the Organize Collection dialog, integration with the gpodder.net web service and remote NFS and SMB collections. This is a beta release, which means that although it’s quite usable for daily use, it might still contain serious issues, eat your chocolate brownies, melt your ice cream or set your microwave on fire. ﻿Read the full announcement here and if you wish to help us make Amarok 2.4.1 even better, please report any new bugs you encounter at bugs.kde.org. 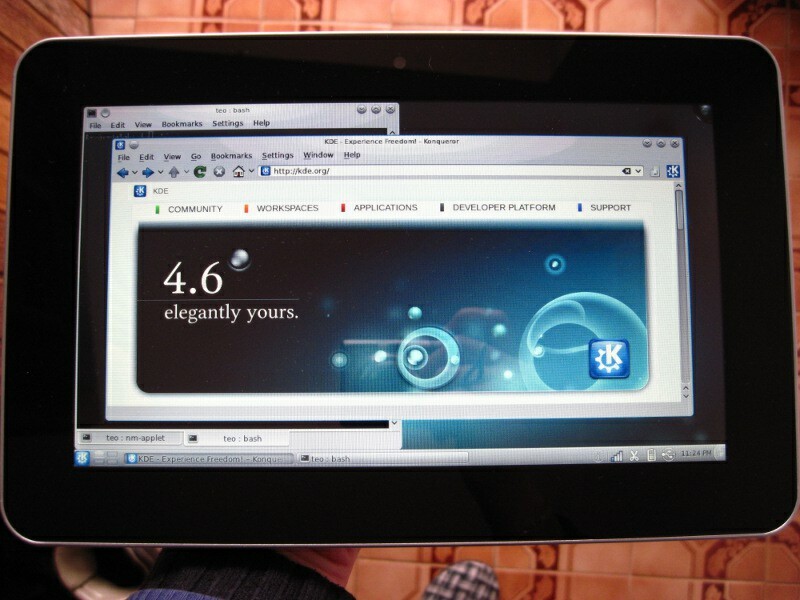 A week ago I got a Tegra 2 based 10.1″ Android tablet called Point of View Mobii Tegra. Its brand is just badge engineering, the same device is sold throughout the world under a variety of other names, including Advent Vega, Smartbook Surfer 360, WSL Xvision and Dreambook ePad P10, and apparently it is based on a reference design by Nvidia. The hardware is quite fast but the bundled Android software feels, well, a bit weird. I say “weird” simply because Android 2.2 is an operating environment for handsets rather than for tablets, and while it’s fast and it does the job, it is hardly the best tool for the job: compared to a smartphone’s 3 or 4 inches, 10 inches of touch screen provide a lot more space for all sorts of touch-friendly widgets and a call for a somewhat different user experience. This is especially noticeable when looking at common widget placements on the screen: Android often expects you to hold a smartphone with one hand, and places relevant widgets close to where your thumb should be. These kind of assumptions fail miserably when running Android on a 10″ tablet. Anyway, like a true fan of KDE my priority was trying to figure out if there’s a way to get KDE SC running on it in some form. This was remarkably easy, thanks to the efforts of some MoDaCo community members, who provided an Ubuntu-based rootfs and a kernel. All I had to do was figuring out how to flash the device with Nvidia’s tools the right way. After that it was just a matter of installing some KDE software from Ubuntu’s armel packages. So the point of this post isn’t technical, it really didn’t take much to have a KDE desktop running on the Tegra tablet. It’s just a bit of proof that it can be done. The user experience with the regular Plasma Desktop is surprisingly fast but overall not very good, and Plasma Netbook doesn’t make it much better. The UI feels too small and is not well suited for use with fingers. I suppose it would work somewhat better with a stylus, but that’s not what these kind of tablets are about. I haven’t had the chance to try Plasma Mobile yet, but even if it brought a huge improvement, I would also need finger-friendly apps. Right now I can see that there’s a vacuum in the tablet market as far as operating environments are concerned. Android is obviously late to the party and WebOS and MeeGo even more so. Could this be an opportunity for KDE? A sensible beginning might be designing a set of finger-friendly widgets and a Plasma workspace optimized for 10″ and 7″ tablets, and defining a list of UI guidelines for tablet-friendly KDE apps. Get a free SpiderOak account - Online Backup and Sync through this link and we both get 1GB extra storage for life!